Yes, you might just BE a dishaholic, IF you have cabinets in your kitchen that are beginning to look like the ones above! And that's just the white/cream china with gold rims (OK, I see a few platinum bands here and there. I'm not a purist, NOR a particularly organized individual). AND there's also an actual china cabinet (that's filled to overflowing). And bulging padded zippered storage cases sitting on closet shelves. And cardboard boxes filled with china wrapped in paper. Is there a twelve step program for people who can't resist buying just one more set of beautiful dishes? 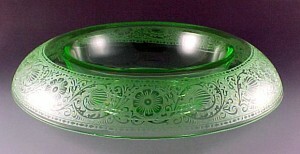 Or for those who can't part with the dishes their mothers and grandmothers used only for very, very special occasions? Thank you to the wonderful Susan at Between Naps on the Porch. Her beautiful blog inspired me to click on the "create blog" button in the upper right corner. Not because I know how to do this, but because it seemed to be an intriguing creative outlet and a way to encounter friendly kindred spirits. I was very pleasantly surprised to find that people were commenting on my first post. Thank you again to Susan for sending her friends to stop by and say hello. I appreciate all the kind words and good wishes. 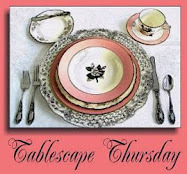 Do I dare participate in an upcoming "Tablescape Thursday?" I don't know ... maybe ... I think I just might! You know, I think tomorrow I'll share my favorite recipe for mojitos -- not guaranteed to keep you cool, but I promise that after a couple of those icy, minty Cuban concoctions, you somehow just don't seem to MIND the sweltering temperatures quite as much! I hope you all have an enjoyable weekend! Oh goodie! You wrote more! Can't wait for your mojito recipe. From one dishaholic to another. . . welcome to the Blogging world, Bill. I have lost count of my dishes, I've got so many, and they are threatening to organize, unionize, demand benefits (handwashing only, and drying with linen towels), and Fridays off so they can rest up for the weekend. I found you through a comment you left on someone else's blog -- can't remember which one! -- but I think you simply must do a tablescape with your dishes, although possibly not all of them at once. And thanks for the Mojito recipe. I've only had one -- One of my daughter's friends made them last summer -- the glass was full of chopped mint and he said, "It's OK, just strain it through your teeth!" I think I'll try yours and give mojitos another shot. All the best, and have fun blogging. It can be addictive. Subscribe to Affordable Accoutrements via Email! Thank you to all of you who have been so warm and welcoming. If you have questions or comments, feel free to write me at affordableaccoutrements@gmail.com. I'll get back to you as soon as possible. I've finally decided to make a few of my vintage tabletop items available to readers of Affordable Accoutrements. I'm starting with a few select pieces from recent tablescapes. Much more to come! 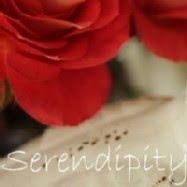 Click the Etsy logo to check it out!